Through the wilds of frozen Mongolia and Siberia Ms Tagalong did not have much opportunity for observing vegetable gardens, community or otherwise. Yaks and goats aside the poultry was also non-existent. Maybe they were there but disguised by snow! So Ms Tagalong was very excited when Mr Ideasman spotted a golden cockerel. We did happen to be in the Winter Palace in St Petersburg, where every single thing was opulent. How strange was this sculpture? Feeling bereft of all things community, Mr Ideasman was chortling and skipping when he found a painting of Ms Mova and Ms Tagalong in the Community Garden in another salon! Ms Tagalong was not amused. Ms Mova and she have been confused with each other not looked at as mother and daughter! This is a more candid picture of one of us! The Chinese love their vegetables. What they don't like though is allowing access to blogs and Facebook, so for nearly two weeks Ms Tagalong has found herself with itchy fingers and blocked sites! It was the first thing really that Mr Ideasman and she noted as they stepped onto foreign land. 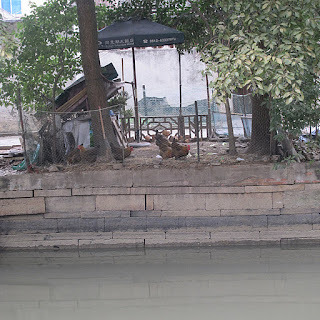 Chinese cabbages, particularly bok choy, are grown on every available piece of unused ground; around trees, in window boxes, in parks and garden beds, in dusty city and country locations. However, when it comes to ornamental gardens the decorative white and purple cabbages reign supreme. 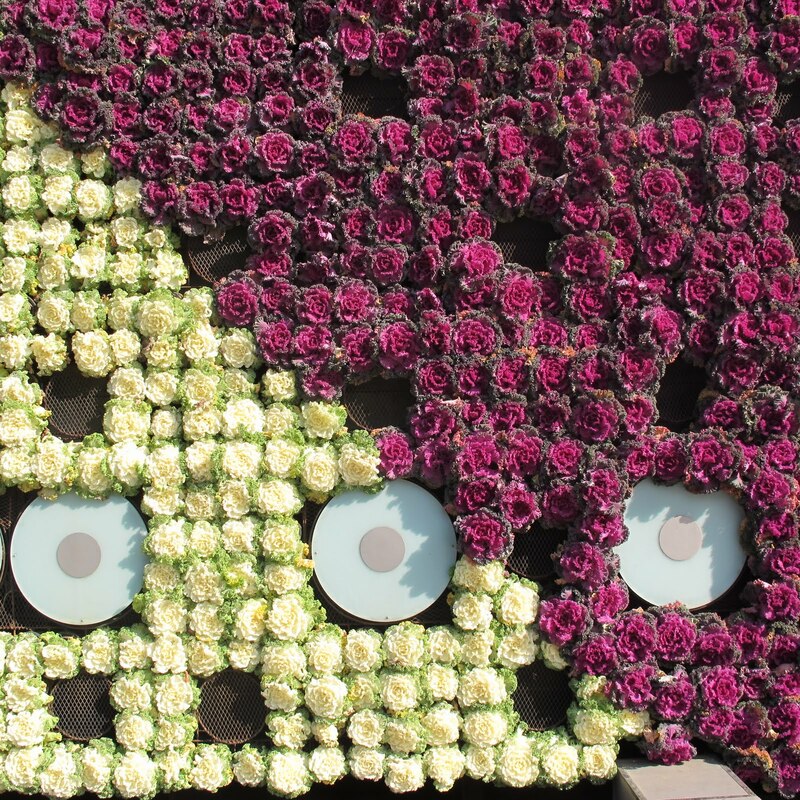 Attracted by the wonderful patterns along the Bund wall in Shanghai, Ms Tagalong ventured closer with the camera and took these photos to show all the gardeners how it is done. Bland, blank vertical walls should be a thing of the past. Ms Tagalong remembers someone saying that the newly constructed wall along Elizabeth Street should be planted with native species but how about cabbages? Dinner and decoration in one! 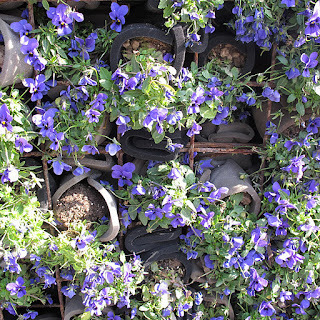 Pansies featured too and in this close up you can see how they are actually placed into the concrete wall by wrapping the soil in foam cones. How would that work in our hot climate Ms Tagalong wonders? Ms Tagalong has also included a chicken photo (how could she not?) 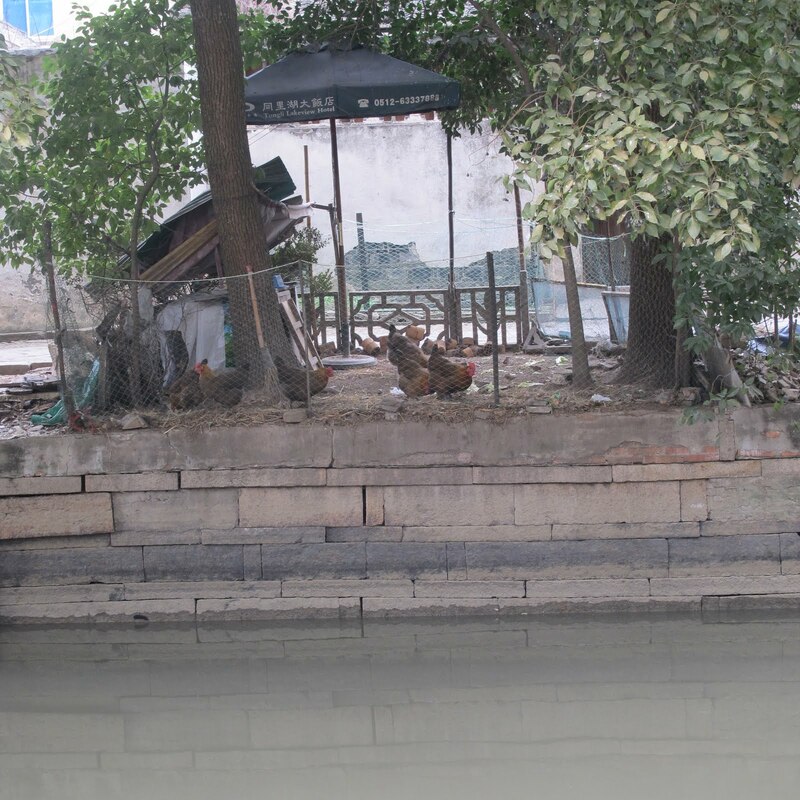 of some plump happy looking chickens alongside the canal bank in Tongli. She did decide, however, to omit the one of the basket of chicken feet in the market!